Kochi, Kerala, December 13, 2011: Spearheaded by the epic Mr. Jignesh Shah, Commodity Online India Ltd., the leading market player in providing information, analytics, advisories, trading and software services to budding enthusiasts of commodity traders announced and unveiled a significant change in its brand name and logo. This announcement was made at a gala function presided over by Mr. Shah along with Professor. K V Thomas, who is the Union Minister of State for Food, consumer affairs, and public distribution. Professor K V Thomas applauded the efforts of Mr. Shah in providing his services in advisory, research reports, mobile services, and newsletters to commodity investors and was very confident about the fact that the company will show further stellar progress with their new branding and the brand new fresh logo. This function was held at the Dream Hotel here. Stating facts about the boom in commodities he mentioned that 48% of India’s GDP comprises of commodity trade. In 2010-11 the commodities trade saw a turnover of 115 lakh crore (50% growth annually). In 2011-12 the turnover was about 106 lakh crore which displays a 72% growth. He said that this has proved that commodities have come far ahead of the race when compared with equities and to keep these numbers consistent developing economies need to put in some amount of effort and the fact that the prices have gone up fourfold in the decade. Mr. Jignesh Shah too, added his bit to the function by launching his bullion portal for commodity online group. The portal is smartly named bullion group. Mr. Shah is the vice chairman of the Multi-Commodity Exchange of India (MCX) and Chairman and Founder of Financial Technologies India ltd. With grand titles to his name, in his keynote address, Mr. Shah asserted that commodities have always brought wealth to the people of a country and the records of which can be found from the sixteenth and the seventeenth century historically. Giving an apt example he cited a cheque payment made in England in the past which would amount to a whooping Rs. 800 crore in today’s day. He congratulated Commodity Online for launching their portal. George Iype, MD, Commodity Online India Ltd, showed a lot of spirit about the gathering and echoed the words of Professor K V Thomas about the hope and delight for Commodity Online India Ltd. For their new logo and brand name and was confident that the company will continue to do well and live up to its legacy. Mr. Binu Alex, Director of this company, got the function to a close with this vote of thanks. The function showed a great audience with around 250 dignitaries from South Indian cities, a mixed lot of traders, investors, and business people who had gathered to bask in the presence of Mr. Jignesh Shah. 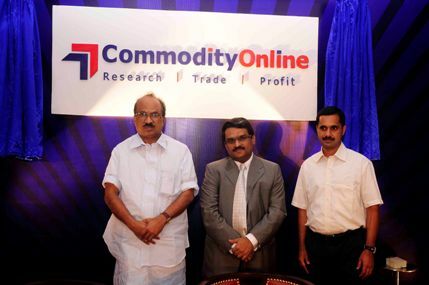 Commodity Online India Ltd., Which has its main office in Kochi, provides information, research, trading and media software services for the commodities industry in India along with a regional office in Ahmedabad, which helps investors with analysis and advisories in the main commodities traded in India’s futures and spot exchanges.